A couple of years ago, I was in a beit knesset in Israel and they had a list of objects that one could donate money for. I recognized all of them but one - the נברשת nivreshet. The closest Hebrew word I knew was mivreshet מברשת - meaning "brush", and I couldn't imagine why anyone would want to donate thousands of dollars towards a brush for a shul. "Heleni HaMalka, Queen Helena, set a golden Nivreshet over the door of the Heichal…" (Yoma 3:10). I wrote that the Nivreshet was actually a rather unusual timepiece. "When the (rising) sun shined on it, it sparkled (from the reflected light) and then everybody knew that the time had arrived for K'ri'at Shema. (Yoma 37b). What is the etymology of the word? Klein writes only that it is "of uncertain, prob. foreign origin" and that the similar Arabic nibras "is an Aramaic loan word". Rav Saadia Gaon in his commentary on Daniel writes that the lamp was lit yearly, and therefore derives from the Aramaic ner bar shta נר בר שתא - "yearly lamp". Steinberg provides a different combination: nevar-eshta נבר-אשתא - "a light of fire". However, my favorite explanation comes from Stahl, following Jastrow. He writes that the Aramaic form of the word - נברשתא - was originally נבלשתא nevlashta. Therefore the root of the word is בלש - to search (guessing why I like this theory?). Stahl points out that on the verse in Tzephania (1:12) - וְהָיָה בָּעֵת הַהִיא, אֲחַפֵּשׂ אֶת-יְרוּשָׁלִַם בַּנֵּרוֹת "At that time, I will search Jerusalem with lamps", is translated by the Targum as: כמא דבלשין בנברשתא. 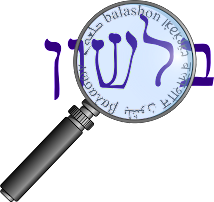 He therefore thinks that נברשת and נבלשת are connected, and perhaps the word developed because one uses a lamp to search for things in the darkness.